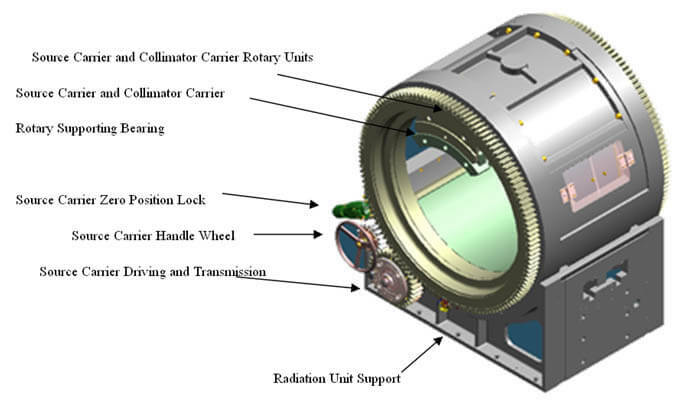 SGS-I is composed of Cobalt-60 Radiation Sources, Radiation Unit, Source Storage, 3-Way Treatment Bed, Localization Devices, Electrical Control System, Treatment Planning System (TPS), etc. 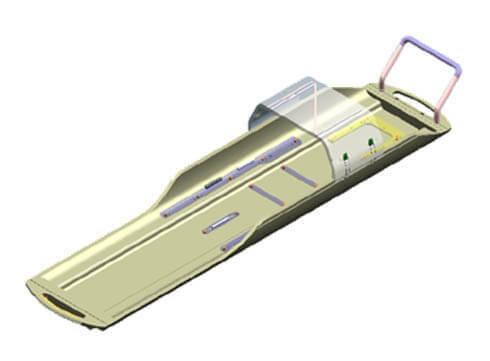 Radiation Sources, Radiation Unit, Source Storage, 3-Way Treatment Bed, External Decorative Cover, and Mainframe Base. 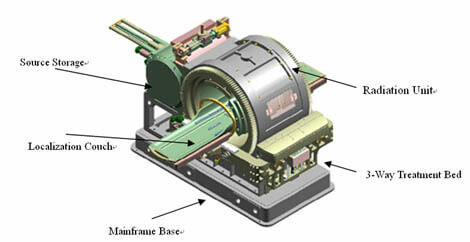 The control system of SGS-I is in charge of the auto-control of SGS mainframe’s moving axes. 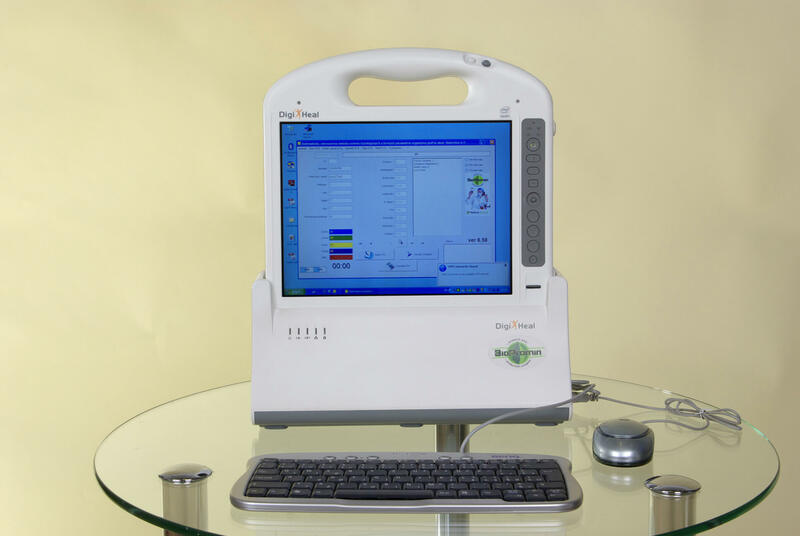 It can systematically perform the treatment based on the TPS planning automatically. The control system can also monitor the operation of machine and safety linkage, which insures that the equipment can be operated safely. In addition, the control system can process failure prompting/directing, save the necessary data, and retrieve the interrupted treatment. The power is supplied by Electric Supply and online UPS. When there is Electric Supply failure, UPS will be able to make the equipment run properly for more than 30 minutes to make sure that the treatment will not be broken off when power is suddenly removed. The voltage of the UPS is 230 VAC, and the power is no less than 5kVA, 0.5h. The actuators of the source carrier and collimator carrier include the drivers, motors, incremental encoders, etc. The position detection and localization among source carrier and collimator carrier is undertaken by the incremental encoders and proximity switches. The state of open/close of the radiation sources is displayed by the status indicator lamp. The rotating speed and rotating range which is used by the upper control computer to control the 6K8 movement controller is determined by the TPS planning. During the treatment, the maximum rotating speed of source carrier and collimator carrier is 1.16rpm. 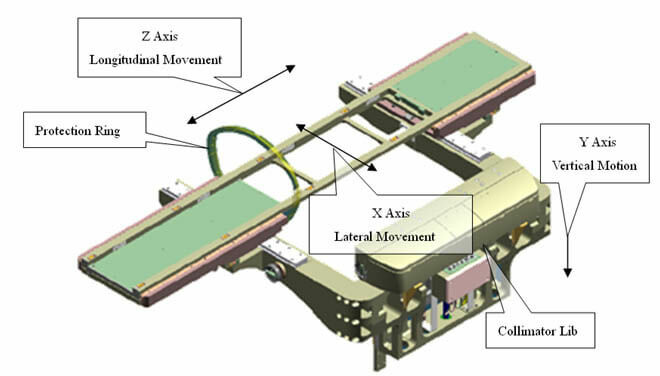 The x, z movement of the treatment bed is achieved by the decelerated motion device driven by the stepping motor. 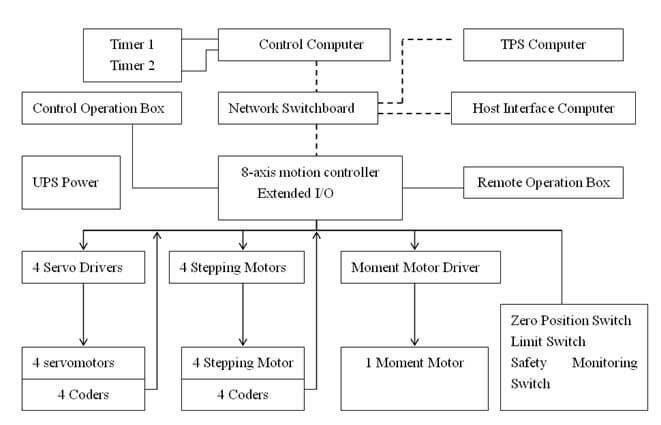 The y movement is achieved by the decelerated motion device driven by servo motor. The position of all the movements is fed back to the 6K8 controller through the encoders, which ensure the positioning accuracy of the treatment bed. Moreover, the three axes on the treatment bed have zero position switches and positive-negative motion limit switches, which can ensure the safety operation of the treatment bed and the determination of the axes’ zero position. 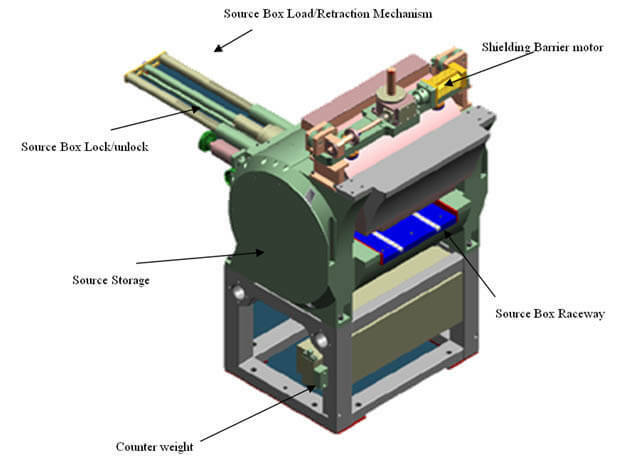 The shielding barrier of the source storage is driven by a servo motor, while the pushing bar and the source lock are driven by the stepping motors. The position inspection is achieved by proximity switches. The control of radiation dosage is composed of two independent timers. These two timers use redundancy association and each can terminate the radiation independently. When SGS-I is started to radiate, one timer is timing ascendingly and the other is timing descendingly. Timers will be displayed in the Remaining Time and Elapsed Time on the control panel. The timers are initialized by the upper control computer. When any one of the timers goes out of order (the value of the two timers has more than five seconds difference or one of the timers powers down), the treatment will be terminated with an alarm and the failure will be displayed on the upper control computer. When the radiation is stopped accidentally, the value of the current timers will be saved individually on the timers as well as the upper control computer for later examination. · SGS-I has two emergency stop buttons. One is on the control panel, the other is beside the machine. · SGS-I has one protect ring which is used to protect the human body against being hurt by the machine mechanically. · No matter when the emergency stop buttons or protect ring operate, the power will be shut off. · SGS-I only can be started up by using keys. · There are emergency stop buttons on the control panel and beside the machine. Only when all the emergency stop buttons are under disarm state, can SGS-I be put in working order. That is to say that SGS-I is put in a state of waiting treatment. When SGS-I is in the state of waiting treatment, the OK indicator light will be shown that the equipment is ready for treatment. The following conditions must be satisfied prior to treatment. · The treatment room door must be closed. 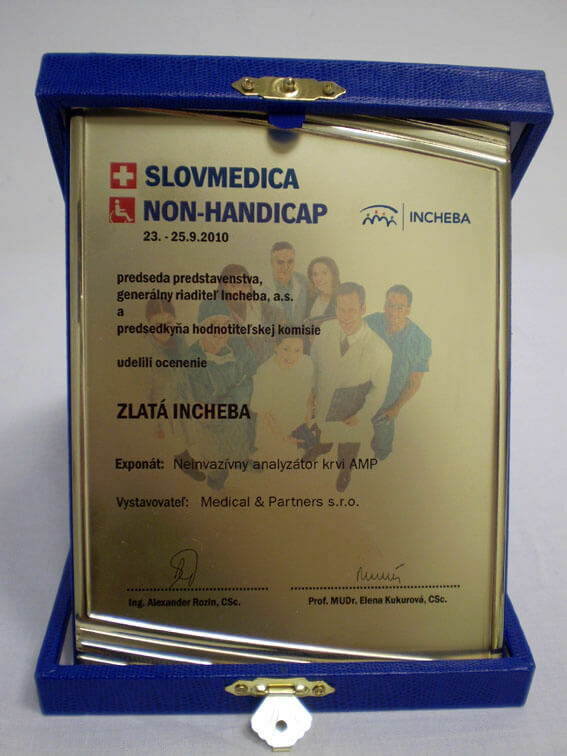 · The treatment time must be re-determined on the control computer, otherwise the radiation cannot be processed. 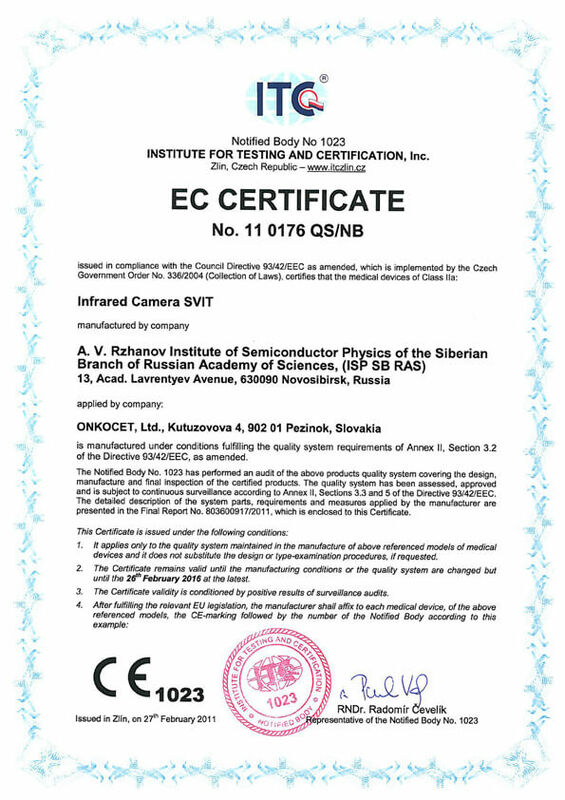 · If the synchronous tracking deviation between collimator carrier and source carrier is more than 1 degree, the radiation will be terminated. When Cobalt-60 sources are in the source storage and the source storage is closed, the state of treatment room is under safe condition. 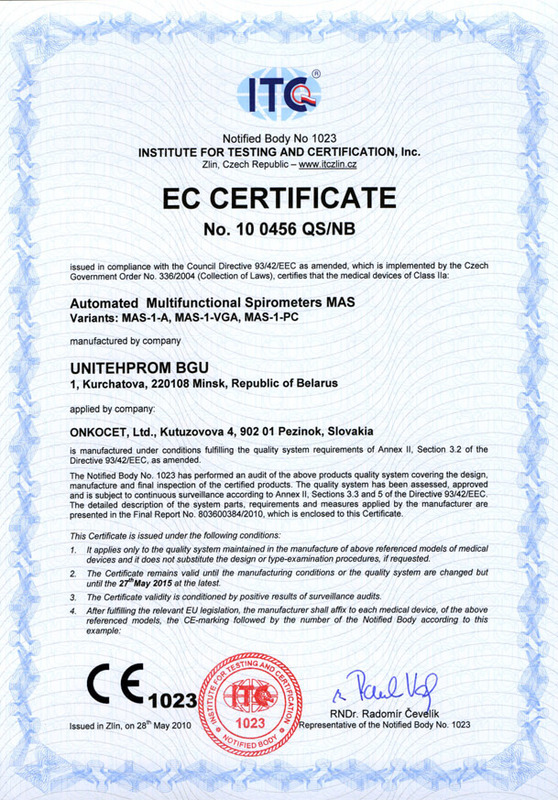 There are two independent verification system used to indicate the state of the treatment room. · Indicator light in the control room: It is controlled by the radiation dosimetric system. The green light indicates safe state, while the red light indicates that cobalt-60 is not in the source storage. Stereo-Positioning Device is one of the important components of SGS-I. Its functionality is to set up a 3-D coordinate system between patients and the equipment, so that the position of lesion can be determined. In the process of diagnosis positioning, the stereo-positioning device is used to accurately determine the target’s size and position in the said coordinate system. In the process of treatment positioning, the lesion is to be repositioned to its initial position and thus the accurate multiple repositioning can be realized. · Primary High Precision Head Positioning Device is mainly composed of stereo localization head frame, fixed head pin, MRI/CT marker frame, MRI/CT adapter rack, etc. · Multi Repetitive Head Positioning Device includes CT, repetitive Positioning Devices, mask, etc. B. 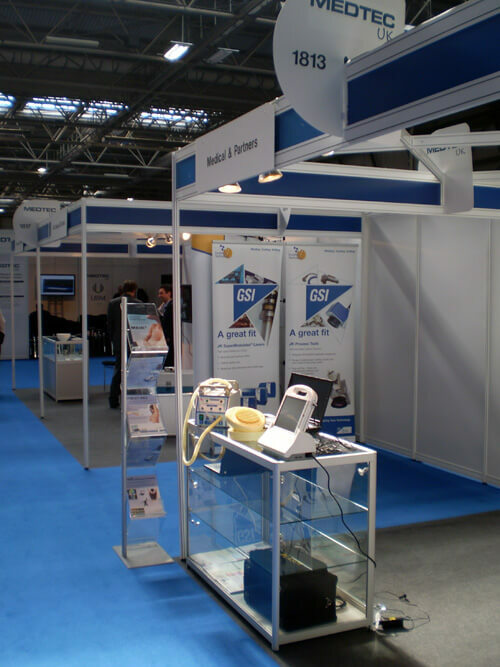 Body Positioning Device can be used to position the patient repeatedly. Human body fixation has two types: vacuum cushion and mask. TPS accomplishes the radiation treatment planning. TPS enables radiation doctors, physicists to do dose planning and optimization for tumor or other diseases’ treatment simulation. 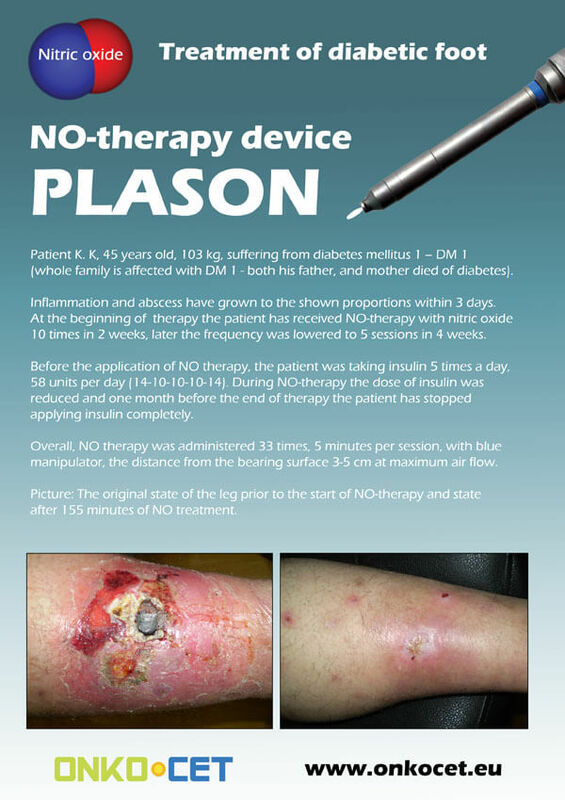 TPS plays very important role in clinical treatment. 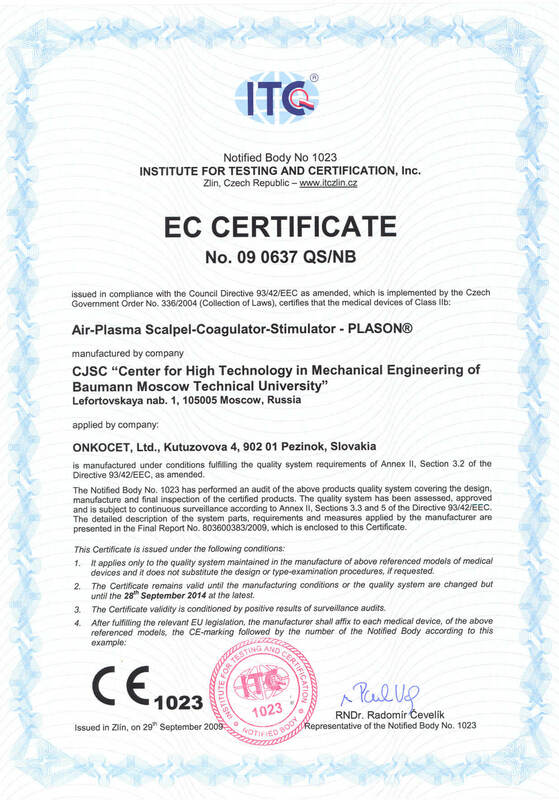 It is a kind of computer auxiliary tools that can be used to help radiation doctors and medical physicists to do dose planning. Through the acquisition and processing of patients’ medical image information, the users can obtain the geometry description of position and volume of body surface, target and VOI accurately. Users can determine the target and arrange the focus through interactive manipulation. The dose calculation will be finished systematically, and the dose distribution of the lesion and the surrounding normal tissue will be displayed in isodose line or isodose surface. Furthermore, users can completely evaluate the treatment plan with Dose Volume Histogram. With the prescription determined, the position of target, the radiation, and the treatment time could be exported. All the treatment parameter will be transmitted to the SGS-I via network. · DICOM network transmission interface (provided by the hospital). · Transmittable Film Scanner gray level> 256(if no DICOM). · Operating System: Windows 2000/XP. The workstation is equipped with double network cards. One of them is connected to the SGS-I LAN, the other one is connected to CT/MRI scanner. 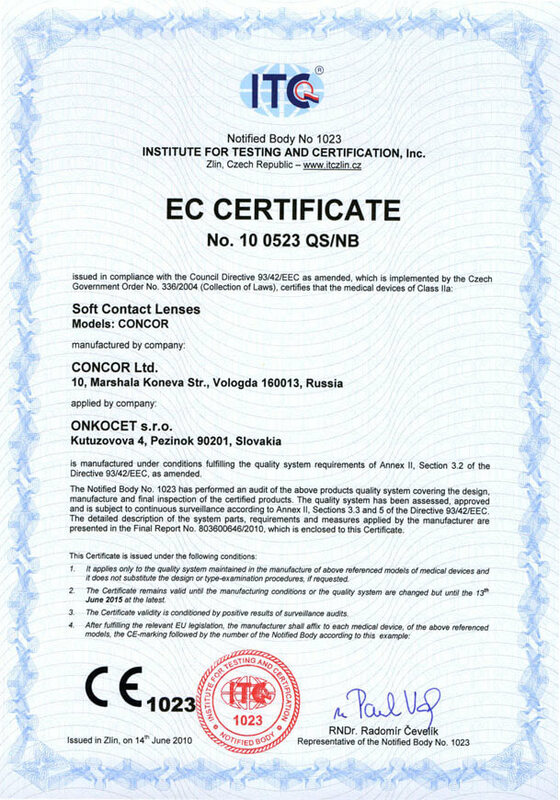 Allowed to modify or reset the machine parameter under the control of certain safety level. The image series could be input to SGS-TPS image database through DICOM interface or film scanner. DICOM interface is used in inputting CT/MRI/PET image series which are DICOM compatible. Film scanner is used to input images of patients on the film. TPS can do the other orthogonal image reconstruction based on the input transverse image series, and three orthogonal anatomical planes can be displayed (transverse, sagittal and coronal section) that goes through any point within the range of reconstruction. Auto-contouring and manual contouring could be done to the external, target and VOI, based on which 3D reconstruction can be achieved with wireframe, transparent and solid. It is to illustrate the position of target, sensitive tissue and external surface in 3D space. SGS-TPS supports semi-auto registration and manual registration. The registration operation includes registration of head CT images, head MRI images and body CT images. With the patients’ target position, sensitive volume position, appearance information of treatment bed cover and the size of metal stand determined, SGS-TPS can do collision detection automatically and the available rotation range can be displayed. SGS-TPS supports single focus, multi-foci and trajectory foci planning. The focus’ parameters (such as numbers, position of focus, collimator sizes, etc) can be set mutually as well as beam’s parameters (such as starting angle and ending angle). Narrow Beam algorithm is applied by SGS-TPS for dose calculation to determine the radiation time of each segmental arc according to the prescription and weighting. 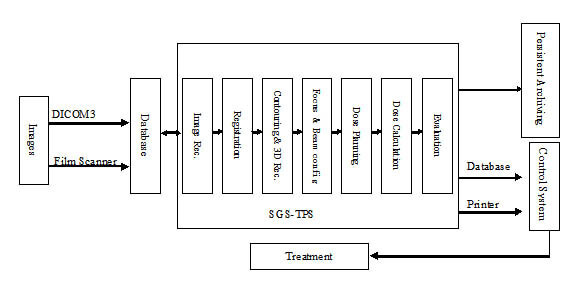 SGS-TPS supports multiple plans and evaluation approaches, including DVH, isodose line in 2D images, isodose surface in 3D display, which will help the users to evaluate the treatment plan effectively. Multiple plans comparison through DVH can be performed by SGS-TPS. Determine the actual radiation dose. Treatment plan, treatment report, DVH and treatment sheet can be printed or plotted, in which there are some important information like focus position, arc beam attributes, radiation time, etc. Treatment report includes patients’ name, planning time, planner, and physicians’ signature column. Evaluation images includes selectable dose volume histogram, isodose distribution of three anatomical plane, and 3D dose distribution (isodose surface, organ at risk). Manage the raw images, volumes and plan information of patients.